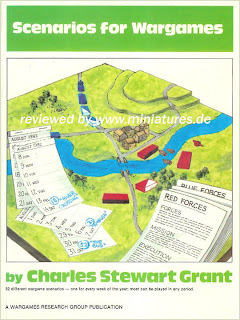 Most of us are familiar with Charles Stewart Grant's wonderful book "Scenarios for Wargames". I propose using it . . . or rather the scenarios in it to create some mini-campaigns . . . a series of logically linked scenarios that will provide the framework for a series of games. Sure, Grant and Phil Olley have done something similar in their volumes "Raid on St. Michel" and "The Annexation of Chiraz" . . . and they are wonderful . . . but I'm looking for some simpler, quick and easy solutions that we can all use. So here is the challenge . . . Create a series of three to seven scenarios from Grant's "Scenarios for Wargames" that will make for a logical simple mini-campaign of linked scenarios. You can even, if you like, make a "campaign tree". That is to build it in the format of "if Red won Scenario A, go to Scenario B . . . and if Blue won, go instead to Scenario C, etc. Let's see what you can come up with, okay? Also, an update on my health. I feel much better although I tire almost immediately due to my heavy loss of blood. The hospital has changed my visit to the operating room from Monday to Wednesday, when they will hopefully find out what's wrong with me. Best of luck with the hospital visit - my ma in law has just had a visit following a fall and consequent broken hip - while she was in she had a couple of pints transfused and said it made her feel like a new woman so I think I can guess how you feel..
Glad to hear that you are recovering, and the best of luck with the next appointment. No copy of the book. Best wishes on your next medical foray. Ladder campaign sent by mail, although the first scenario was from Battlgames Issue #1. Best wishes for the hospital visit. I'd like to do the campaign idea, but a friend borrowed my copy of Grant's book years ago, never to return it. Grr! Ah! Just realized the ladder campaign I sent uses "Scenarios For All Ages"
I have C.S. Grant's book - and his other book as well, which could add a new dimension for, say, a solo campaign. On top of that is the book he authored in collaboration with Stuart Asquith. All my best wishes to you for the speedy restoration of your full health and vigour. Certainly a list or "tree" from "Programmed Scenarios for Wargames" would be an excellent thing as well . . . I chose the first book because I think that it is more widely available. And the "All Ages" book or the Battlegames Magazines "Table Top Teasers" are also food for the same project. looks like I will have to get a copy now, good to see you up and blogging Jeff. My advice... relax, not sage like I know but a relaxed positive mind and body can face anything. Very interesting idea - I'm not sure that I'll have time, but it certainly bears thinking about. As far as I know, the original "Scenarios For Wargamers" is the longest out of print of the three. It was certainly like the proverbial hens' teeth when I was looking for it (though I recently stumbled across it by accident on eBay) The easiest available equivalents would be Steve The Wargamer's reposts of the original Table Top Teasers from thirty years ago). However I've gone for Programmed Scenarios for Wargamers as it's the book I've had the longest, plus it's suited so solitaire wargamers like myself.